Bollywood is packed to the gills with controversial figures. From the open support of the studio system by the Mumbai underworld to frequent trysts with dirty politics, very few members of the old Bollywood system can say that their hands are completely clean. There are even fewer, though, who have been actually arrested, sentenced, and served the time for their crimes, and legendary bad boy Sanjay Dutt is one of them. To say he's led a cinematic life is an understatement. Born the scion of a filmy family with a mother who was Bollywood's biggest actress through the '50s, Nargis, and a film hero at the same time in Sunil Dutt who legend says met on the set of India's first Best Foreign Language film nominee Mother India when the latter saved the former from flames in a stunt gone wrong. Sanjay Dutt's career began in the early '80s as an action hero and he's continued through to the present day in spite of bouts with drug addiction, gun running, prison sentences, and links with terrorism to have become a sort of folk hero whose legend precedes him. 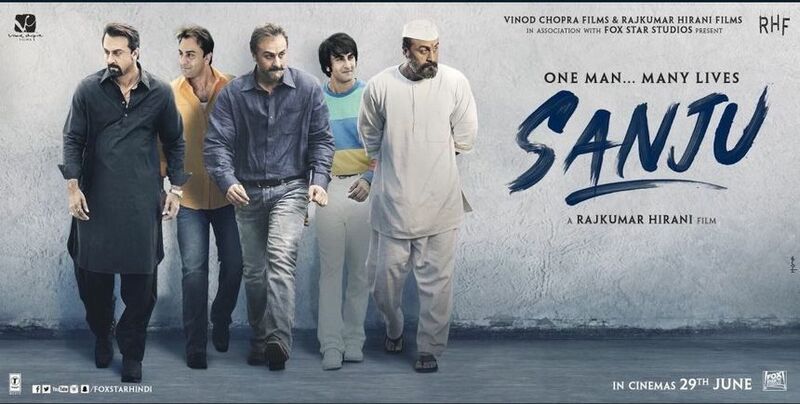 The biopic Sanju (the nickname by which Dutt is commonly known among Bollywood fans) stars Ranbir Kapoor in the title role, a dicier proposition for a pair of stars who are both still working actors. Kapoor is one of mainstream Bollywood's biggest talents and his ability to sell material that would otherwise be completely outrageous has made him a star with films like Barfi! and the critical and commercial flop (that I adore) Jagga Jasoos. If anyone can pull this off, it's him. The film is directed by Rajkumar Hirani, a filmmaker who has most recently focused on big budget comedies like the Aamir Khan blockbusters 3 Idiots and PK, but who brought Sanjay Dutt into the 21st century with a huge success in Munna Bhai MBBS, a film that is regularly named as one of the top Bollywood success stories of the new century. The teaser gives an idea of the tone that Hirani and Kapoor are aiming for and it's shockingly lighthearted, especially given the seriousness of the challenges Dutt has faced in his life and career, but with Hirani's past it should've been obvious. As nervous as I am about the film, this is a team that I have a lot of faith in so I can't wait to see the final result.